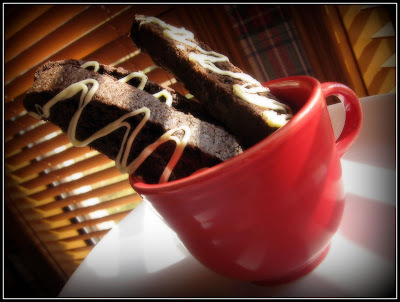 Gorgeous dark chocolate biscotti drizzled with white chocolate. Line large baking sheet with foil. Sift flour, cocoa, baking powder, and salt into medium bowl. Using electric mixer, beat sugar and butter in large bowl to blend. Beat in eggs 1 at a time, then vanilla. Beat in flour mixture. Stir in dark chocolate chips. Drop dough by heaping tablespoonfuls onto prepared sheet in two 10- to 11-inch-long strips, spacing 3 inches apart. Using metal spatula or wet fingertips, shape strips into 11- by 2 1/2-inch logs. Refrigerate 30 minutes. Preheat oven to 350 degrees F. Bake logs until tops are cracked and dry and tester inserted into center comes out clean, about 25 minutes; cool 10 minutes. Reduce oven temperature to 300 degrees F. Using foil as aid, lift logs onto work surface. Line baking sheets with clean foil. Using serrated knife, gently cut warm logs crosswise into 3/4-inch-thick slices. Arrange half of slices, cut side down, on each prepared baking sheet. Bake biscotti until just dry to touch, about 8 minutes. Turn biscotti over. Bake until top is dry to touch, about 8 minutes. Cool on sheets. Melt the white baking chips in a small plastic bag in the microwave, squishing the bag in 15 second intervals. Cut the tip off of the bag, and pipe white chocolate onto biscotti. 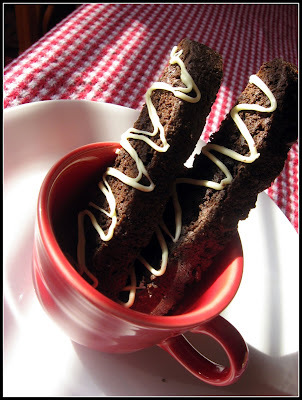 9 comments on "Dark Chocolate Biscotti"
I still need to try making biscotti!! And if you think these had a lot of butter - I made some shortbread bars this weekend that had 1 pound of butter in them!! I need to post about them still, but I need to spend a few extra hours at the gym first! I haven't made biscotti in years, but have been thinking of it for holiday gifts. This sounds like a great recipe. I'll have to check it out. Love the photos! And I'm gearing up for TG, too. My father in law loves pecan pie. Those look great Emiline! I've never made biscotti. Glad your feeling better. Glad you're feeling better! Those cookies look outrageously good. I'll have to add this recipe to my always growing biscotti collection! Btw, very cute baby. I finally had a chance to check out some of your previous posts! I wish you could bring those to my house by Thursday. Yum! Deb- They're the most gourmet cookie around. You must try making them. They are rather delicate, though, so be careful. Looking forward to your shortbread post. Kelly- They would be perfect for holiday gifts. They keep really well. Just bake them a few extra minutes. Jenny- You either? You must make some for the holidays. Thanks, I'm feeling better. Annie- Thanks! Unfortunately that cute little baby isn't mine-he's my sister's. I love that contrast between the darkness of the biscotti and the bright white of the icing. Looks mighty yummy!!! I don't get to do thanksgiving till probably saturday cause I gotta work thanksgiving and friday after that. Boohoo!!! Enjoy cooking! Can't wait to see the results! Yum! I love making biscotti for holiday gifts. I'll have to try that recipe.